I believe that as we read the Old Testament, looking for ways that the events and stories therein show a similarity to the Savior Jesus Christ, that we are reading the text as Nephi directs when he said, “Behold, my soul delighteth in proving unto my people the truth of the coming of Christ; for, for this end hath the law of Moses been given; and all things which have been given of God from the beginning of the world, unto man, are the typifying of him” (2 Nephi 11:4). Jesus shares this thought when, after his resurrection, he walked on the road to Emmaus with two of his followers and said, “O fools, and slow of heart to believe all that the prophets have spoken: Ought not Christ to have suffered these things, and to enter into his glory? And beginning at Moses and all the prophets, he expounded unto them in all the scriptures the things concerning himself” (Luke 24:25-27). To Jesus, the Old Testament should be read as something that has everything to do with him! In this line of reasoning, I wanted to share a short list of ways that Joseph of Egypt (Genesis 37-45) points us to Jesus Christ. This list is not all inclusive, and there are times when I have taught these chapters, and then after we have gone over the story, I have asked the question, “What does this story have to do with Jesus Christ? 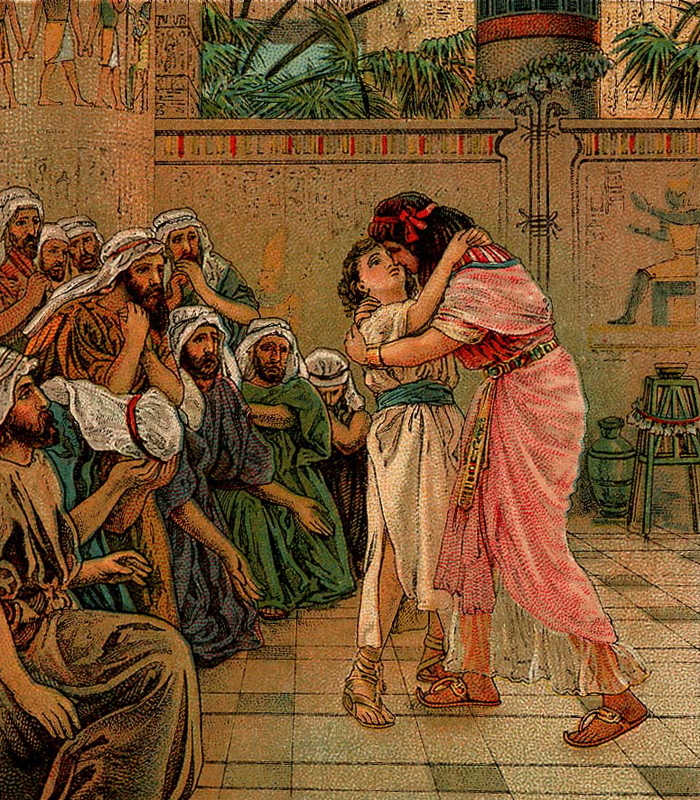 In what ways does the story of Joseph and his family illustrate the life of Jesus?” Many students are unaware that that this story is a type of Christ, and are excited to see this connection. 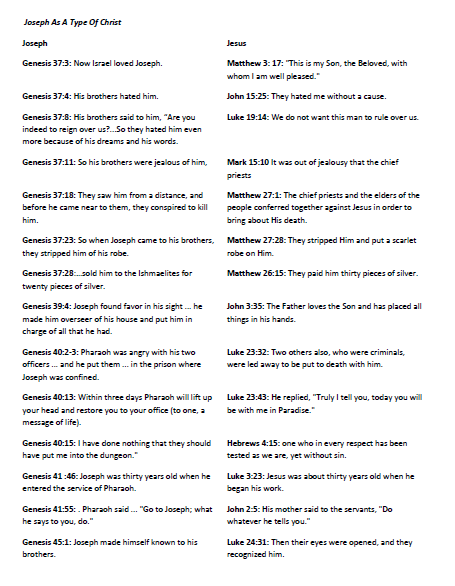 This chart does not appear perfectly as I would like it, but you can download it here: Joseph As A Type Of Christ list. See also Parry and McConkie’s list on how Joseph is a type of Christ. This entry was posted in Families, Forgiveness, Grace, Jesus Christ, Mercy, Old Testament, Symbolism. Bookmark the permalink.